Getting organized can sometimes be problematic for people with busy schedules. The need to manage time and organize tasks is a continuous requirement on a daily basis. Yet while most web apps that does this remain elusive in function and purpose, only a very few are worthy of attention, let alone usage. 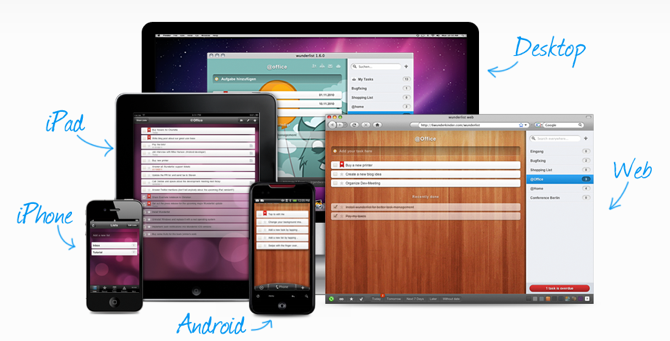 Hence, I decided to drill down 5 web apps that allow people to organize and manage tasks easily online. Nirvana is a web based task management app which is based upon Getting Things Done (GTD) methodology of staying organized. Getting things done is a concept which calls for writing down the intended tasks and projects, and then breaking them into smaller manageable tasks. Nirvana is both available on a free and paid options. The free option allows for unlimited actions, 5 Projects, up to 3 Reference Lists and a Secure SSL Connection. The paid option allows for access to unlimited features as well as a secure SSL connection. In terms of usability, Niravana is as good as it gets. Users can create Projects, Tasks and Reference lists. The only down side however, is that it doesn’t have mobile support. DoIt.im is another wonderful web based task management app. It works in four simple steps. 1) Collect — which allows you to create tasks, 2) Manage and organize tasks, 3) review – which allows you to review tasks and finally 4) Pick next action and To-Do – which allows follow up with the next task. If you happen to be a ‘minimalism freak’, this app might just be the right app for you. Wunderlist is a web app that allows for a seamless management of tasks as well as integration with the two leading mobile platforms (Android and iOS), and most importantly it is ‘free’ to use. It allows to the management of to-do lists as well as sharing of tasks with people in your circles, ( (ie. Family members or co-workers). What sets this application apart from the rest is that, regardless of which device you decide to use, it keeps all your tasks in sync and updated. In terms of aesthetics, design and functionality it is probably one of the very best out there. Google Tasks is Google’s attempt to Task management. What sets it apart is that it is underpinned by Google’s integration with Gmail and other Google products like Google Calendar. If most of your online activities revolve around Gmail, it may be wise to give it a try. When you create tasks in Gmail, it gives you the option of sending the created tasks to people — and if you have synced your cellphone number with Google Calender, it automatically sends you sms reminders for your tasks. DropTask is a new web app that allows you to view projects and tasks by visually mapping them. If you intend to work with other people on projects, then this is probably the best application for that. What differentiates it from other task management applications, is its ability to manage responsibilities by assigning tasks or groups of tasks to different people on a project. The video below probably explains it better.